Today LinkedIn introduced redesigned profile pages that will enable you to better engage with your network. The company has been on a roll recently, introducing new features like real-time notifications and LinkedIn Endorsements, as well as redesigned Company Pages. LinkedIn rounds out a season of change with a simplified profile page design centered around three core ideals: simplified editing, building relationships, and offering rich insights. When editing your profile, you’ll now be shown sections that are relevant to your profession, including projects, languages, patents, certifications, and so on. Students can take advantage of new sections like courses, test scores, and honors & awards. When viewing your profile, you’ll noticed that LinkedIn has condensed the most important information, making it easier and faster for visitors to learn about you. This also puts focus on actionable items, such as connecting or sending a message. Your recent activity has been added directly below your personal details. This puts a lot of attention on the content you’re sharing on the social network, so make sure it’s quality stuff. Just below the Activity section is Background, where detail your present and past experiences. 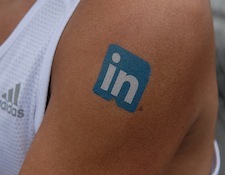 LinkedIn makes your professional story more visual by pulling in company logos for those listed. To the right of your profile is a new visual representation of your network, including profile pictures of people you might know, the strength (or level of completion) of your profile, and a visual breakdown of your network. The updated profile will be rolled out over the next few months, but you can sign up now to be one of the first. 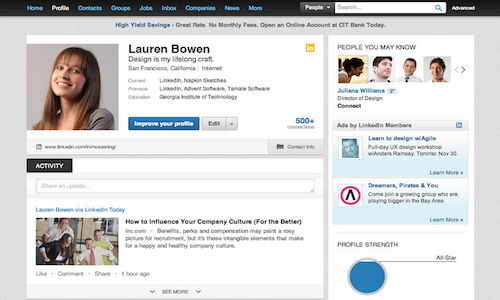 You can learn more about the new profiles on LinkedIn’s blog.